New figures show how dependent the public finances are on the multinational sector. AROUND FOUR-FIFTHS OF Ireland’s windfall corporate tax take last year came from multinationals, highlighting the economy’s ongoing dependence on the foreign sector. A new Revenue analysis of company tax receipts from the last two years showed that in 2015 about 80% came courtesy of non-Irish businesses. That left the remaining one-fifth to be paid by indigenous firms. Corporate tax was the main driver of Ireland’s better-than-expected overall exchequer returns last year, when total revenues were €3 billion ahead of expectations for a total of almost €46 billion. Revenue took in €6.9 billion from corporate tax last year, a near-50% rise on the €4.6 billion haul in 2014. The increase was put down to both an increase in the number of businesses paying tax in the Republic and those already operating here handing over more. Investec Ireland chief economist Philip O’Sullivan said the tax breakdown showed how “hugely reliant” the country was on multinationals. “Foreign-owned multinationals account for a majority of total GVA (a measure of output) in this country every year, so it is no surprise that they would account for the bulk of corporate tax receipts,” he said. 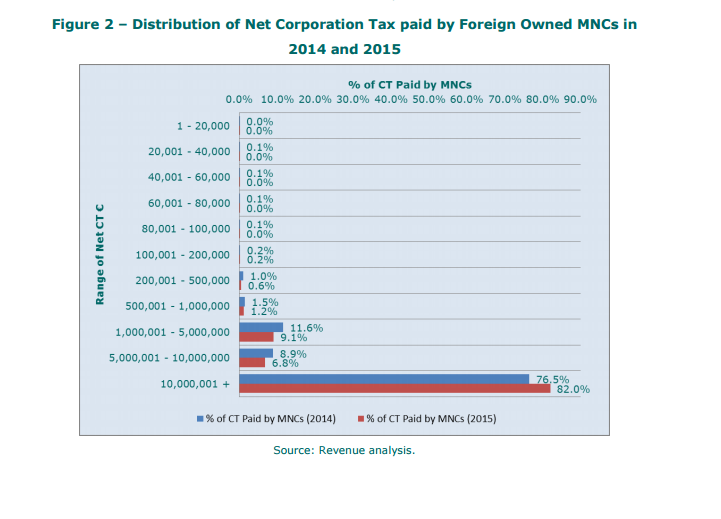 The majority of the revenue from multinationals came from companies that paid out more than €1 million, according to the analysis. More than two-thirds of the take was made by companies that paid €5 million or more, while receipts from the ten highest-paying companies contributed €1.7 billion. Revenue said that the growth in receipts in 2015 “reflects improved trading conditions, in particular of foreign-owned multinational companies”. However, it added that payments from native businesses are also performing well and growing at similar rates. While there have been concerns raised that Ireland’s multinational-dependent corporate tax take isn’t sustainable, O’Sullivan said there is no need to worry about a sharp drop in the near future. “Last year’s data show that there was a significant transfer by multinationals of intangible assets, mostly patents, from subsidiaries located in other jurisdictions to Ireland,” he said. Overall, Revenue found that the effective corporate tax rate, or the rate at which companies are actually paying tax on declared profits, hovered around 10% from 2011 to 2013. During 2014, the most recent year for which data is available, the effective rate was slightly lower at 9.7%, partially because of an increase in research and development claims. Revenue said that the effective tax rate for companies is always lower than statutory rate of 12.5% “due to the application of certain reliefs and credits”.